Gareth Long - Education: Celebrating people :Statues - a job half done! Celebrating people :Statues - a job half done! 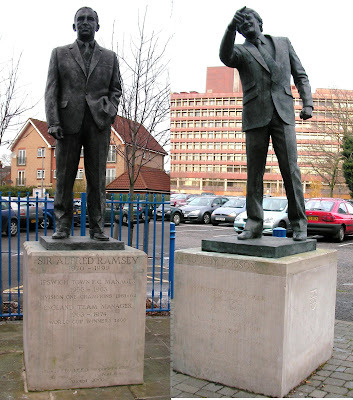 Visiting Ipswich to day for a meeting in an office block near Ipswich Town Football Club (ITFC), I was pleased, but then very disappointed, to see two statues of key people near the stadium. Sir Alf Ramsey and Sir Bobby Robson, both sporting icons, former England football team managers, and former managers of ITFC, have had statues placed in their honour just outside the stadium in different roads. However, in placing them, little thought seems to have been given as the environment they were placed in and the final look to give them the respect they deserve, both as pieces of art and as to who they portray. They both back onto car parks and these ultimately therefore dominate any view. Even in the short time I was there, people were taking photographs - but the entire backgrounds of both are various cars, which is really a bit naff! It could be a planning issue, but that makes no sense, maybe it just needs a bit more thought and design! It would have been much better if there was a backdrop behind each of the statues to really make them the features they deserve to be, without the rather nasty distractions behind. We are spending a lot of time talking about celebrating students work in learning environments. We really must model this in the community as well. It's a pity but these could be displayed so much better. Well being - we all need it! Celebrating events - a job done well. Managed Learning Environments... Green is good!